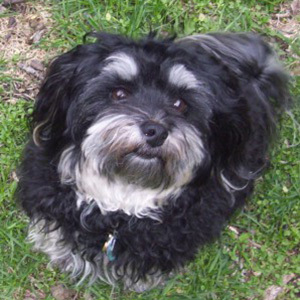 Riley is a mellow Havanese whose favorite visit is one in which he can sit on someone’s lap and fall asleep. He loves belly rubs and back scratches and has perfected the art of what one client refers to as the “Riley Spin” – where he greets the person and immediately spins around so his back might be easily scratched. He loves other species, and gets incredibly excited when he encounters a cat, rabbit, or guinea pig during a visit. Julie says he’s been quite disappointed when animals don’t seem as excited to see him. Julie & Riley visit as a North Star Therapy Animals team in a variety of places. Riley loves the PAWS program at the University of Minnesota because he can lie down on his blanket and collect lots of pets and scratches for two hours without moving a muscle. Julie & Riley also visit at oncology clinics, nursing homes, assisted living facilities, and most recently the MSP Airport. When visiting, Riley likes to cuddle with people. Julie recalls one visit to an oncology clinic where Riley curled up and fell asleep on the lap of one of his regula clients. When Julie made a move to get him so they could move on to someone else, Riley scooted back in the lap so that he couldn’t be reached. There they sat for 45 minutes – with Riley snoozing and the client petting his back. During his down time, Riley enjoys resting while at home. He also enjoys walks with his much older Springer Spaniel sister. Havanese do a wonderful job of entertaining themselves, and Riley is no exception. He likes to have someone throw his toy, but is just as happy to throw it himself…he actually can throw it quite far.